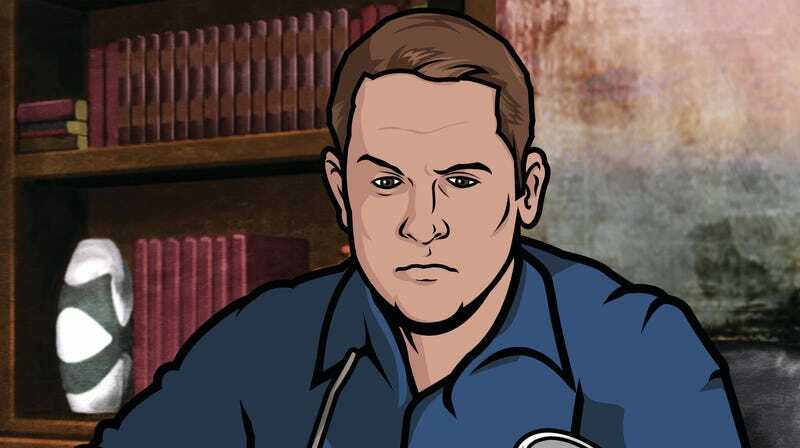 For nine seasons (and 101 episodes) Adam Reed’s Archer has been a staple of TV comedy, introducing the world to the Danger Zone, “sploosh,” tactical turtlenecks, and all the phrasing jokes any one person could possibly take. (Which, uh… Phrasing.) For the last two years, though, it’s also been one of the most defiantly innovative shows on the air, abandoning the spy antics that were once its bread and butter in favor of a series of rotating coma-dream anthology seasons, exploring the P.I. noir and tropical adventures playing out in Sterling Archer’s bullet-addled brain. Tonight’s Danger Island finale made it clear that Archer won’t be waking up any time soon, either, instead ending with a teaser for a season that looks to basically be Archer In Space. Earlier this week, we hopped on the phone to chat with Reed about the decision to keep his superspy hero unconscious, the Applebees-set Archer season that tragically never happened, and his decision to step away from the show at the end of its next year on the air. The A.V. Club: Let’s dive right in: Can you confirm that season 10 is going to be set in space? AVC: And specifically, a very Alien-looking kind of space, if the Danger Island finale was any indication. What were the influences on the design of those scenes? AR: It’s all ’70s clunky set design and production design. It’s supposed to have a feel of, like, somebody’s idea of the future from 1970. So any nods to Alien wouldn’t be the Giger-influenced stuff, but more just the sort of prevalent aesthetic at the time, of clackity keyboards and hoses and just overall clunkiness. AVC: Is that because that’s what Archer thinks space is like? AR: I think that’s a good question. And I think that probably, in Archer’s subconscious, he’s not going to know what the future is. He’s going to know what the movies and pop culture of his era depict the future as looking like. He’s going to have a 1970s vision of the future. AVC: When did you know this was the direction you’d be taking the show’s tenth season in? AR: In a way, it was like three years ago. A pretty long time. Not that this coming season is all mapped out and written, but the setting was something we’d talked about at the end of season seven. AVC: Is there a big document of different season ideas just sitting around somewhere? AVC: What’s the best terrible idea on there? AR: I wanted them to all work at a fast-casual restaurant called Archerbees. That was problematic for a whole bunch of reasons, but I think we could have done an okay job with it. AVC: That’s basically the show’s philosophy at this point, right? That you can put these characters anywhere and get something enjoyable out of it. AR: Yeah. They’ll hate each other no matter what their job is. AVC: Danger Island made a lot of references to “Heart Of Archness.” Now you’re heading to space, which the crew also visited in season three. Are those references intentional? AR: Nothing is intentional. If it seems intentional, that is probably an unintentional coincidence. AVC: Do you see these characters as the same people, just in different settings? Do you give H. Jon Benjamin different notes to play Danger Island Archer versus Dreamlands Archer versus regular Archer? AR: No, I see everybody as the same people, especially as they relate to Archer. Cyril might be a German spy, but the way he relates to Archer is basically the same: Archer hates him. Lana is a Pacific Islander princess, but Archer is still infatuated with her but doesn’t like her as a person. The key thing is, “How does everyone relate to Archer?” How they think of Archer, and how Archer thinks of them, is the constant. No matter where they are or what new accent they have, it’s all about how Archer is perceiving them. AVC: Does the nature of the “dream” seasons heighten that? This year, you functionally turned Cyril into Mecha-Hitler. Is that a reflection of how much Archer hates him? AR: Yeah, definitely. What’s the worst thing Archer could project onto somebody? Well, they’re a Nazi. Well, that’s not bad enough, so okay, now they’re a robot Nazi. “I want to destroy that person.” It’s about trying to out-Cyril Cyril, to make him a bigger nemesis for Archer each time. Trying to crystallize and amplify all the other characters, as seen by Archer. AVC: From that point of view, why make the Pam-Archer friendship such a focus this year? AR: You know, I’m not entirely sure. That pairing is fun, and as we were slotting everybody into their roles, it just seemed natural. The inspirations for this season, the films and movies of that 1930s serialized adventure, a lot them were something where the guy always had a sidekick. So Archer needed one, and because his relationships with everybody else have always been so borderline toxic, he and Pam are like the only two who can stand each other. So that seemed like a natural fit. And then, to make her a huge bodybuilder was sort of a nod to Han Solo and Chewbacca. Like, it would be great for Archer to have this huge enforcer looking out for him. AVC: And then also a magical talking parrot. AVC: Is this the last we’ve seen of Crackers? Krieger’s name is on one of the cryo pods in the final scene. AR: He could always just be a giant robotic parrot in the future. A space parrot. AVC: These varied settings have given you a chance to jump around to a lot of different locales. What will you miss most about doing Danger Island? AR: Well, Crackers. And all that lush scenery was really great to look at. I’m not sure the physics and spectacle of space battles, for me, can be as moving as dog fights in airplanes and smoke and grease and spluttering engines. It’s all so much more romantic than laser beams. I’m sure whatever the art team comes up with is going to be beautiful, but the setting sun coming through plantation shutters is just, for me, so beautiful to look at. Its going to be a little tougher to do rich afternoon hues on a spaceship. Although, I guess they could cruise around a sun somewhere. I don’t know, I don’t know how space works. I’ve got to Google that. AVC: This upcoming season is the last one of your current order. Is this the end of Archer? AR: I honestly don’t know what’s going to happen. I think everyone has been studiously avoiding talking about it. Although [Laughs.] I’m sure that will change soon. AVC: How long do you feel like you could keep doing this show, personally? AR: As far as I’m concerned, [season 10] will definitely be my last season. But Archer may keep going without me. I should know more about that probably very soon after your article posts! AVC: Archer has a lot of jokes that are designed around building up an expectation, then smashing it to pieces. What is it about that kind of intentional anti-climax that appeals to you? AR: I’ve always liked it. Like, going back to [Reed’s earlier Adult Swim series] Frisky Dingo, it was ostensibly about a superhero and a supervillain destroying the Earth. But following those stories bores me, because they’ve been done better than I could ever do them, so many times. So I tend to put up this wallpaper, and then never talk about the wallpaper again. So these guys ended up both being blind and naked and roommates. And I like building up those expectations, and then ignoring them to concentrate on some tiny, seemingly unrelated thing, and getting all the characters distracted and going down some other rabbit hole. I don’t know, it just makes me laugh. AR: It’s tough, because I can totally see their point. And, you know, I read their comments, I lurk in the comment sections and read the reviews and totally get people’s points about that. But my goal has been—and obviously I haven’t reached it every time, or nobody would be upset—but my hope is that even though it’s a new setting and new roles for these characters, that people will become as invested in that season’s storyline as they were in previous seasons. And some people are. But definitely, some people aren’t. But I would want them to know that the people making the show feel just as emotionally invested in the lives of the characters. We root for them just as hard, even though it’s not, quote unquote, the “real” world of Archer. I worry about them just as much in a volcano as I do in a car chase shoot-out.